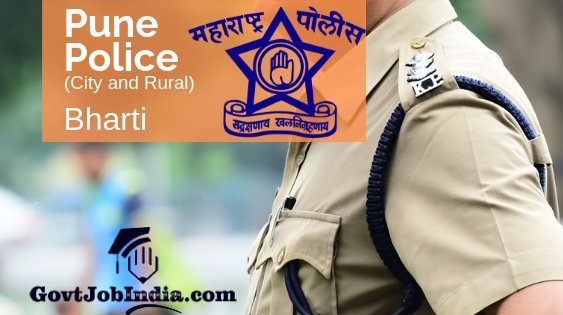 Pune Police Bharti 2019– Given below are the details of the Pune (city, SRPF and rural) Police Bharti. The official advertisement PDF which will be released by the Maharashtra Police Department calls out for a total of 537 vacancies for the posts of Constable. This is divided into 4 major chunks which are 1. 213 Posts in Pune City, 2. 161 Posts in Pune (rural division), 3. 180 Posts in the Pune SRPF 1 department and 4. 83 Posts in the Pune SRPF 2. If you wish to apply online for his recruitment then make sure that you go through the entire article before applying online on the official application form. The official sites of the recruitment board are a few in number. The first one would definitely be the official site of the Pune Police which is www.punepolice.co.in. The other ones will be the official sites of the Maharashtra Police Recruitment which are mahapolice.gov.in/Recruitment and mahapolice.mahaonline.gov.in. You can start out by reading through the entire article and checking if you are suitable for the recruitment. If you are, then do not waste a single minute and apply as soon as the start dates come up and make sure that it’s definitely before the last date to apply online. The Maharashtra Police Bharti is planned to be conducted across the state and you can know more about it by going through the link- Mahapolice Bharti 2019. This Mahapolice Bharti is a part of the Mega Recruitment conducted in Maharashtra, namely the Maharashtra Mega Bharti 2019. Now, let us continue with the Maharashtra Pune Police Bharti 2019. Candidates should have a fluent knowledge of Hindi and Marathi. Selected Candidates in this Pune City Police Department, will get a pay scale of 5,200 to 20,200 Rs. (Grade Pay – 2,000 Rs.) with Special Pay 500 Rs. and Other. Do you require help with the application process of recruitment? Are you looking for the steps on how to apply for the Pune Police Constable Bharti 2019? If yes, here are the steps which will help you have a smooth application process. But some of the details which you will need to fill in the application form are:- Applicants’ First name, Middle name, Last name, Fathers name, Mothers name, Date of Birth, current active mobile number, photograph, signature and Adhaar card. How to Apply Online for the Pune Police Recruitment 2019? On the homepage, you will find the official link which will take you to the advertisement PDF. Now, skim through the details and check if you are eligible. Finally click on the online application link. Alternatively, go to the link given below and you will be taken directly to the form. Fill all the essential details asked in the form and attach the documents required. Make the final payment and take a printout of the application form which is duly filled. Are you satisfied with the article about Pune Police Bharti 2019? If yes, then ensure that you share this article with all those who might be looking out for a splendid job like this. In addition, if you have any doubts about any of the subparts of the recruitment, comment below and let us know as we will clear it out swiftly. In conclusion, make sure that you are subscribed to our website @GovtJobIndia.com for the latest updates about the newest govt job notifications.